The American Society for the Prevention of Cruelty to Animals (ASPCA) was founded by Henry Bergh in 1866. This ASPCA pin features the “Angel of Mercy,” a figure that would become an important part of the iconography of animal advocacy during the late 19th- and early 20th-centuries. In this example the Angel of Mercy halts the actions of a man who is beating his horse. The scene unfolding is one of extreme heartlessness–the horse has collapsed due sheer exhaustion from pulling an overloaded cart, but instead of coming to the aid of the horse, the driver of the cart begins to use a stick in order to force the terrified and tired horse on. This Angel of Mercy image was used in a number of different contexts, including the pin featured below. The artist has made some very specific compositional choices in order to capture the emotional qualities that would exist in a confrontation such as this. For example, the raised hand of the Angel of Mercy echoes the raised fist of the man at the centre of the composition and these gestures form a visual tension that underscores the gravity and urgency of the scene unfolding. 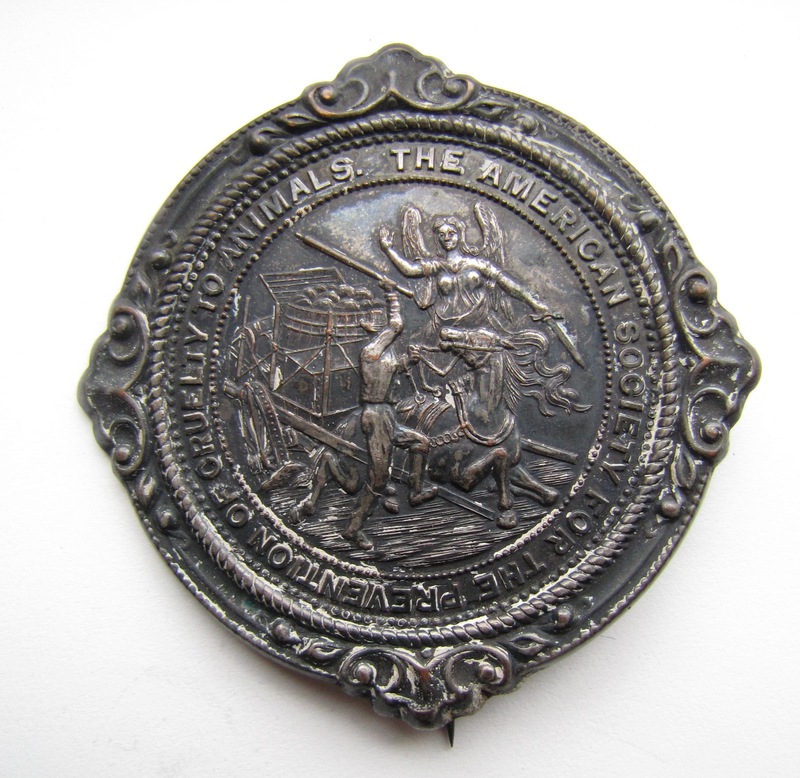 American Society for the Prevention of Cruelty to Animals Pin, c. late 19th C. Collection of MSPCA Angell. This version of the “Angel of Mercy” was used by a number of different organizations during this time period and, as such, was widely reproduced and easily recognized. Below is a version of the same image used by the Quebec Society for the Prevention of Cruelty to Animals. Quebec Society for the Prevention of Cruelty to Animals Logo, late 19th C. Logo designed by John Henry Walker. Collection of the McCord Museum. The repetition of this logo worked as a continual reminder of the need for Humane Societies, SPCAs, and Humane Education.